I have just read a delightful book by Doreen Virtue called "101 Archangels". I have been incorporating references to the archangels in my daily meditation for some time now and wanted a more in-depth knowledge of the various archangels and so was delighted when someone picked this book off my Amazon Wish List last Christmas. Doreen Virtue is a leading authority on the topic of angels and is an angel practitioner. 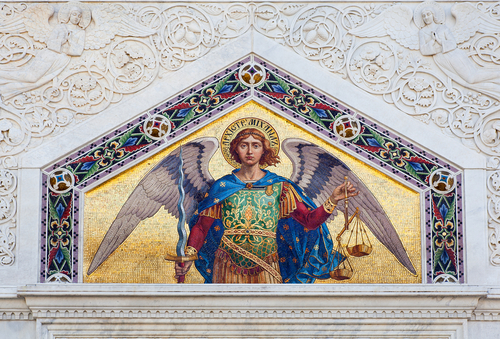 She focuses on 15 of her favourite archangels including the principal archangels, Michael, Raphael, Gabriel and Uriel. I love Doreen Virtue's style always illustrating points with stories of real people she has come across in her work. The book itself is beautifully illustrated and I can see that this is the sort of book you would want to keep by your bedside to dip in and out of from time to time. She explains what each archangel's special powers are for example, did you know that in addition to having a very important protection role, Archangel Michael can help fixing broken electronic equipment. Each Archangel has a colour and the book is colour coded in its pages to reinforce this. There are plenty of suggestions for meditations to each archangel and I am going to develop my own guided meditations to help people take advantage of the wonderful help and assistance that these powerful archangels can bring to our lives. It is a very non-denominational book but gives historical detail where this is available for each archangel. All in all a wonderful book, easy to read and well worth investigating.